The Beverage Factory offers only brand new aluminum Co2 Tanks. We do not sell reconditioned steel tanks. 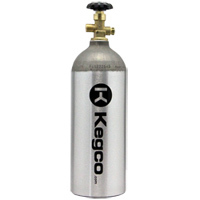 Every Co2 cylinder is produced from high strength aluminum alloy 6061-T6. These tanks are popular because they are not as heavy as steel tanks and do not rust. The service pressure is up to 1800 PSI/124 BAR with a test pressure of 3000 PSI/207 BAR. These cylinders are stamped with required U.S. Department of Transportation a Markings. The 320 Valves are CGA approved, and have a male thread for Co2 Regulators. Comments: We bought a keg system and 5lb Co2 tank (Catalina 5 lb. Aluminum Co2 Tank [CC B5]) through BeverageFactory.com. Hooked it all up in a fridgerator along with the Co2 tank . We got a slim 1/4 barrel which took us about three weeks to go through. Then we purchased a 1/2 barrel but to our dismay our Co2 tank is empty. We sent BeverageFactory.com customer service a request asking for assistance/advice as to what our problem might be and never received any correspondence or help back. We have not able to identify any leaks and the system is hooked up per the instructions. The tank is refilled but unfortunately it is not going much better for the 1/2 barrel. We are honestly concerned that the tank won't even last this keg. Staff Reply: Hi Eric, thank you for your feedback. I'm sorry to hear about the lost tank of gas and I'm glad we were able to troubleshoot the system over the phone today. Based on our conversation, it seems the tank is working properly. As we discussed, the high pressure gauge on your regulator will drop when the tank is placed inside the refrigerator. This is normal because the cold temperature causes a drop in the tank pressure.You can always spray your connections with soapy water when you initially set up the system to ensure there are no slow leaks. Please feel free to call me directly if you have any other questions or need assistance with your system. Comments: Great quality tank, just writing this review to say that mine came branded with a big Kegco logo printed down one side. It came off fairly easily with a scotchbrite pad. Just something to consider if your tank exchange place wanted to be picky about that kind of thing. Other than that it was perfect. Good for a year or so! Comments: Its hard to find solid info about how much you can really push with this size 5# tank. I am at fourteen (14) 1/6 kegs with my tank! And that is with the CO2 tank inside the fridge. I think I am at the end after this keg is finished. Unless you dont want to deal with refilling it once year, I recommend this tank for its size and capacity! If once a year is too much, I suggest the next size up.